My work is a life long struggle to connect to the world through painting. Painting is a force, a way toward the infinite. I see a through-line from the edges of the universe, to the surface of the Earth, to the cells that we are made of. Natural structures are built and demolished causing endless patterning. Humans build and destroy creating the pattern of civilization. My paintings begin with and are about my relationship with these patterns. As a trained geologist, I often begin with rocks. They contain astounding patterning, chaotic and ordered, and extremely varied in colour. Already abstracted, they are full of dynamic energy. They tell great tales of the history of the Earth, of millions of years of deposition, movement, collision and deconstruction. Slow and mythic in proportion, the history of the Earth’s rocks establishes an archetypal framework for my work. In practical terms, I use rocks as a starting point to explore my interest in patterning. I create a web of shapes evoking hydroelectric lines, lots and concessions, roads, city grids, quarries and mines, river systems, aerial photos, tectonic plates, satellites and human tissue. My paintings then reflect landscape as often transformed through development and always imbued with human memory. I use a router to carve into a surface, to mimic how land is transformed over time and through technology. The router makes the patterns definitive and seemingly permanent. My work is deliberately bold, rugged and lacks sentiment. My earlier incarnation as a scientist allows my investigations to be provocative and creates a comfort level for accidents. Through experimentation, I have learned that all outcomes are valuable. Accidents offer different directions for the patterns making works that are farther and farther removed from their starting point. The process is an unfolding story, a state of breakdown and reformation, a search for the appropriate ending. My painting is an evolution, a slow process from an idea to art, a struggle between the cerebral and the sensual. It reflects more heart and soul than brain. And it is the colour in my work that represents the violence and metamorphosis in patterns. Colour keeps the work in balance; it represents heat and change. Colour is like the rocks themselves, alive and moving all the time. Necessarily fraught, my work is both calculating and romantic. I am prone to paint and live in this dichotomy. E. G. Blundell was born in London, England and immigrated to Canada in 1962. He remembers lying in a field as a child watching some balloons disappear into the vast emptiness of the sky. He remembers looking at everything on the ground. After graduating from University, he traveled throughout Europe looking at art. He then began to paint. He researched the techniques of other artists and took some courses. In 1992, his appendix burst and he nearly died. Shortly thereafter, he began exhibiting his work. He is inspired by Chaim Soutine, Anselm Kiefer, Turner, Van Gogh, Francis Bacon, Paterson Ewen, David Milne and the Abstract Expressionists, among others. His work has been exhibited across Canada, including the Winsor Gallery in Vancouver, the BUSgallery, Zsa Zsa, V. MacDonnell Gallery and Joseph D. Carrier Gallery in Toronto, the Belgo Building in Montreal, Gamma Ray and Artguise in Ottawa, the Robert McLaughlin Gallery in Oshawa, the MacLaren Art Centre in Barrie, the Thunder Bay Art Gallery and the Art Gallery of Sudbury. His exhibition at BUSgallery was listed by EYE Weekly as one of the 10 best exhibitions in Toronto in 2001. He was artist-in-residence at the Straumur Arts Commune, Iceland in 2001and at Pouch Cove, Newfoundland in 1998. 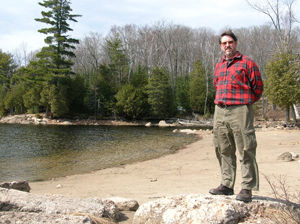 His work can be found in collections throughout Canada.